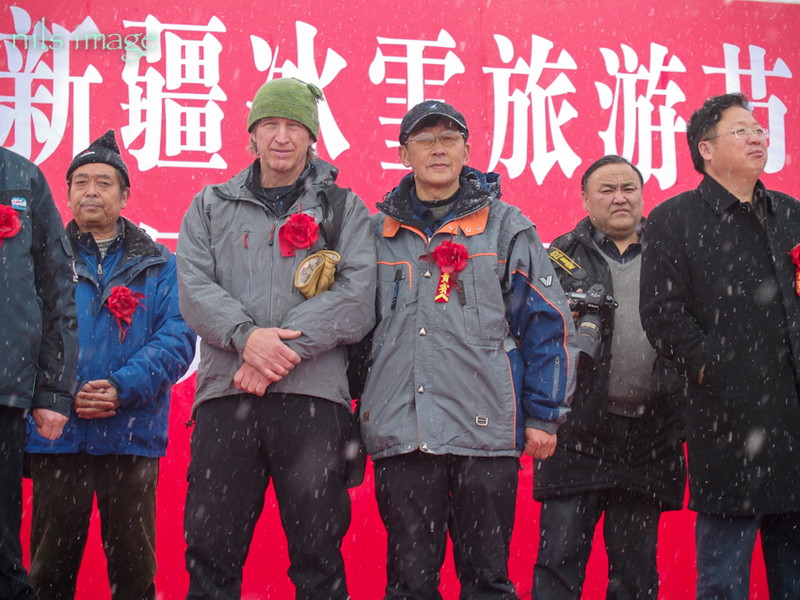 Three of the archeologists from Urumqi, Wang Bo on the far right next to Ayken. 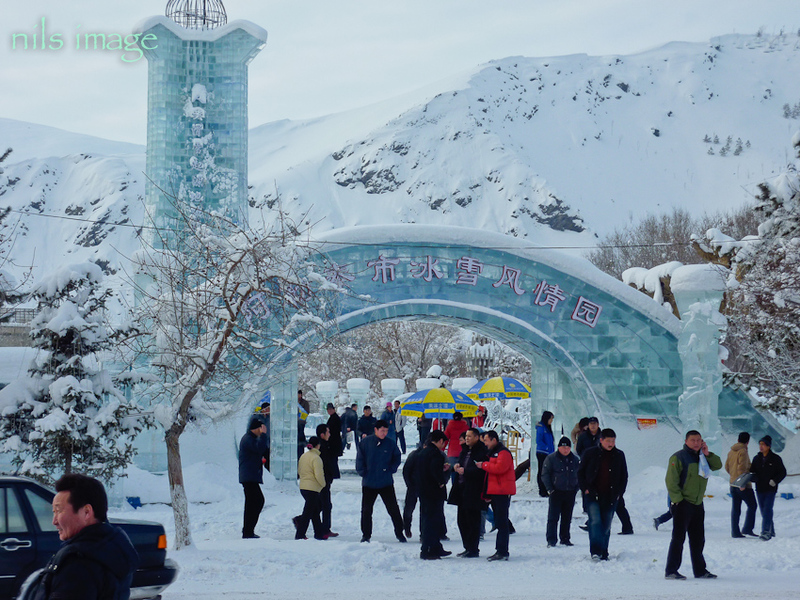 The entrance to the ice sculpture exhibit in the main square of Altay City. Very impressive! The road to the ski area. 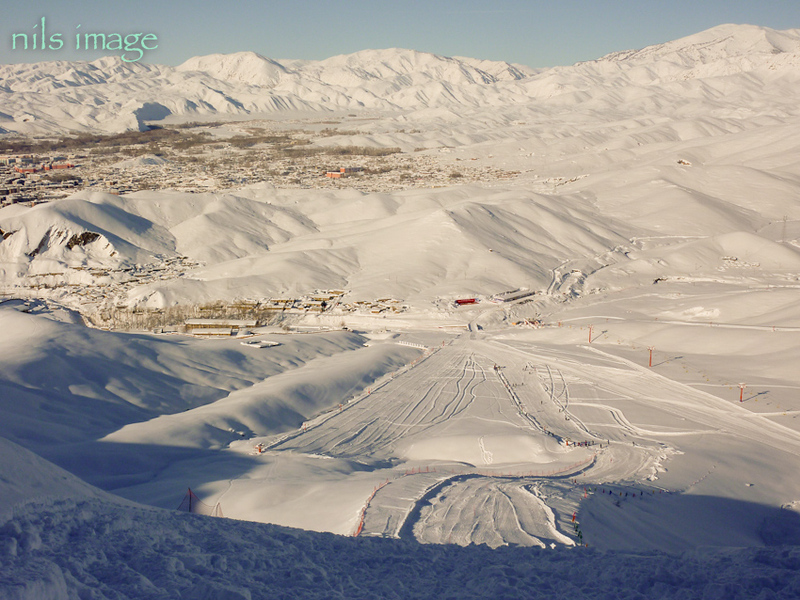 Altay City itself invested in the new ski area, which is much larger then anything else in the area. The artist rendition of the new Altay City ski area. Not sure what the reason is for the ultralight and the parachute, perhaps to give it a sense of scale. There is a collage of stuff photoshoped together here but there is indeed 3 lifts, one a long chairlift with perhaps 1500 vertical feet of gain. Shan Zhaojian and I at the opening ceremonies to the race. 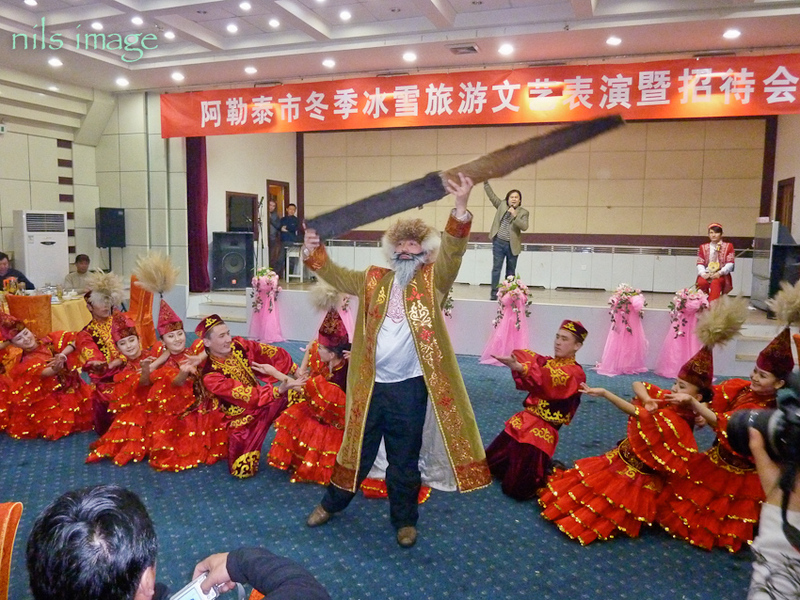 Being the only westerner at these events, I am often put on stage for photos and what not. The start of the race. There were over 50 racers in the event, generally in teams from different towns or districts, all with there own very enthusiastic supporters. 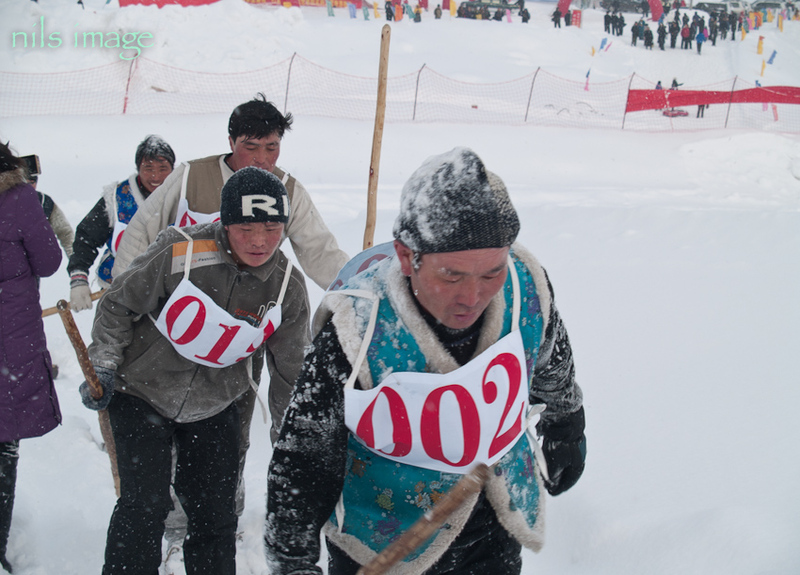 Racers on their initial climb up the hill. Taken part way through the first of two 6 km loups, Bater, my young friend from near Kanas is the 2nd skier here and came in 7th overall. The fourth racer in this picture is Mulchen, who will go on to win the race. These races always include some good climbs and downhills, closer to a rando race then a xc race by our view of things. In the background you can see a fairly steep downhill, home to some spectacular crashes as well as impressive runs. Batu, one of the top racers from the Hkom area showing some strong climbing technique. He finished 4th in this race. Mulchen, the winner here and the winner of every race he has entered. He is the son of Tuntek, from the Hkom area. 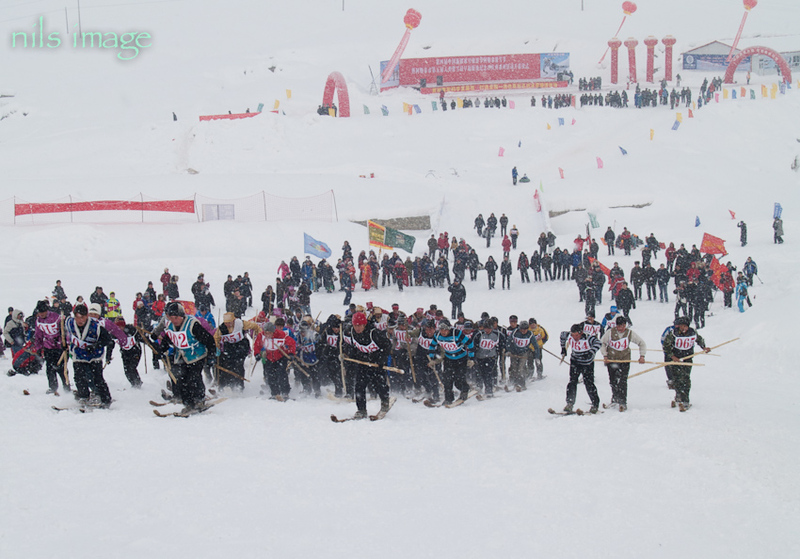 The night of the race in Altay City – heavy snow and more in the forecast! 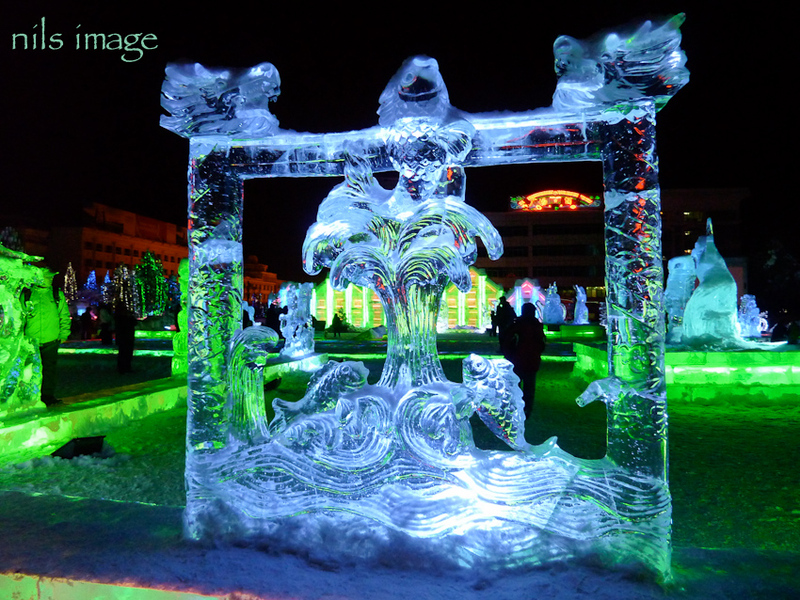 Some of the ice sculptures on display – lots of water themes, a bit strange in world that’s frozen solid. Closeup of a rabbit head. Part of the big whup up the night of the race. 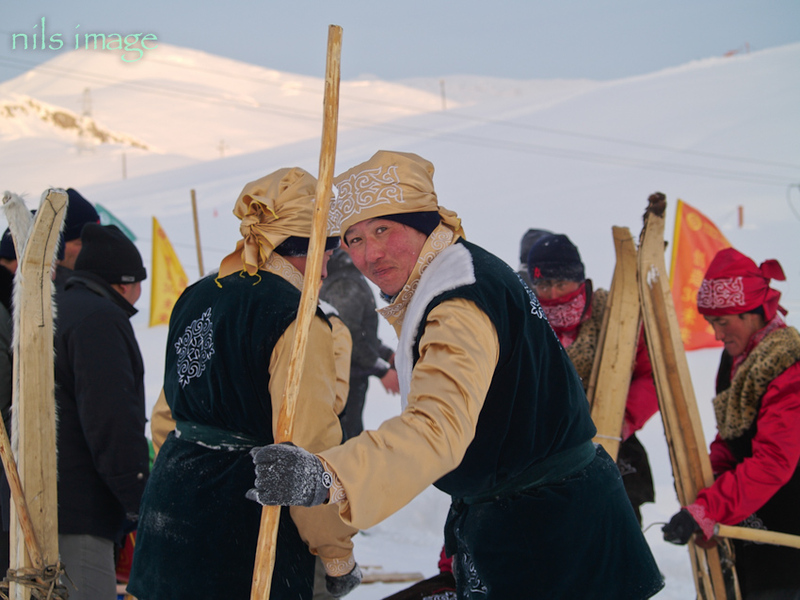 Lots of elaborate performances with dancers, singers, local musicians… This one was the enactment of the Original Ski, in theory out of Kazakh mythology. A bit like a hollywood musical with lots of over the top costuming. Some great dombra playing and singing by both men and women. 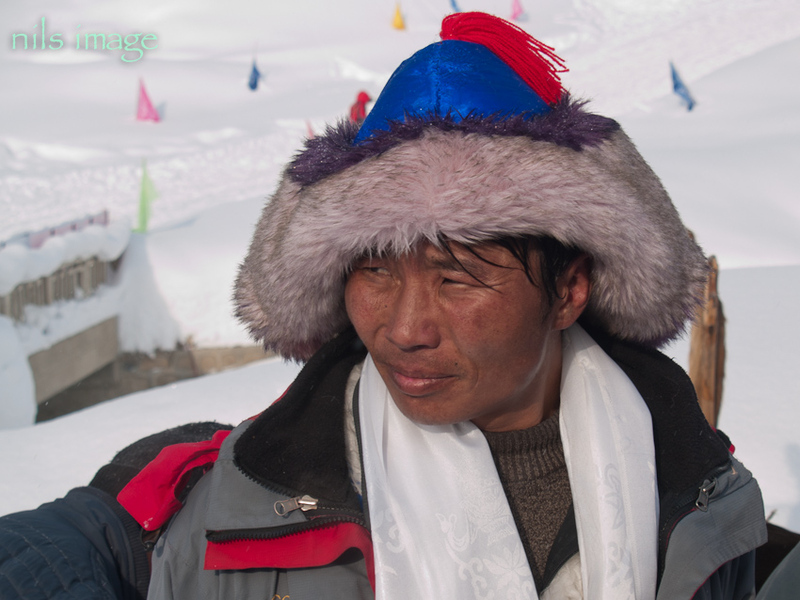 Kazakhs in particular and nomadic people in general (in this region) seem to be in love with showy hats. The diversity and gaudiness is truly impressive. 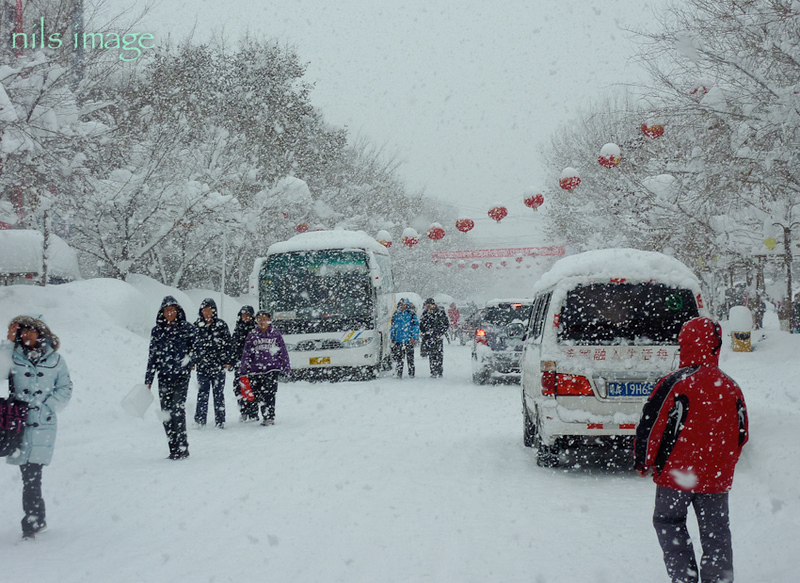 The day after the race the snow continued in force, locals remained unfazed. In the afternoon on the day after the race we went up to the ski area as local and national film crews wanted to try and get some added footage of the traditional skiers who were still in town from the race. My skis were a bit of a curiosity. They had seen downhill equipment but not backcountry bindings (3 pin) and, a real anomaly, nowax (fish scale) bases. 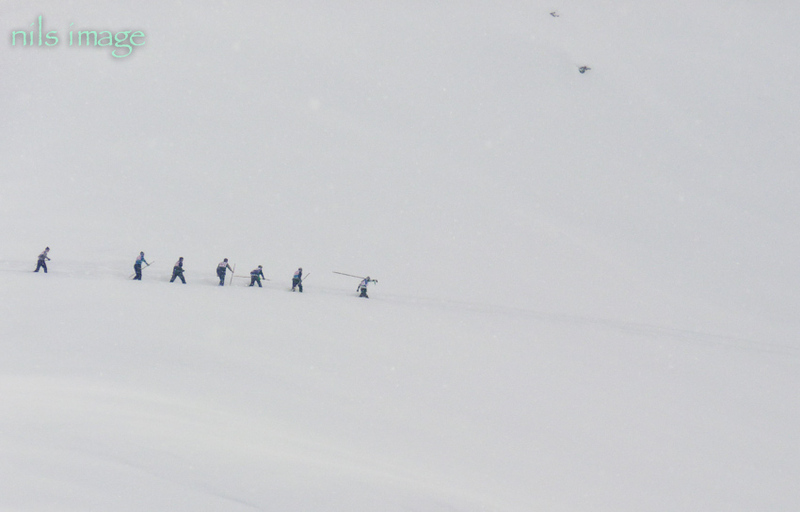 Skiers from a town just north of Altay. 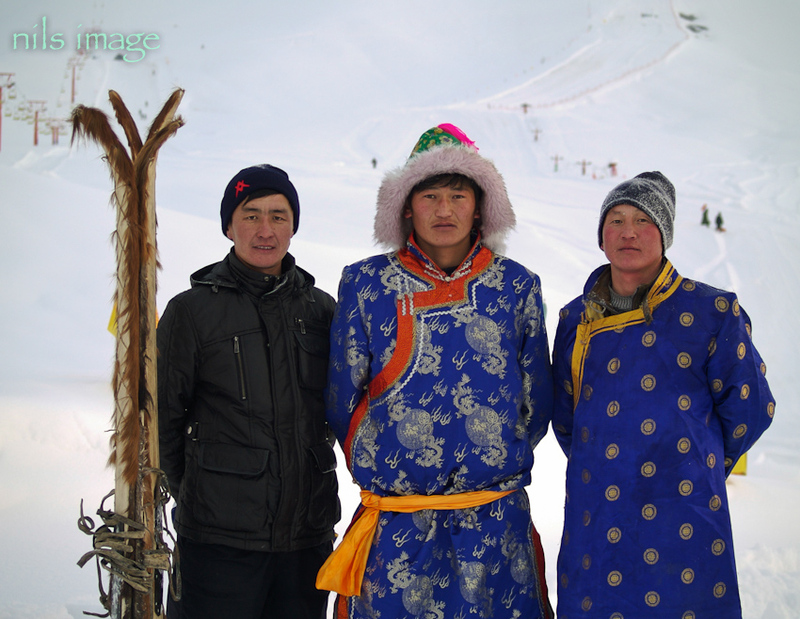 Three skiers from Khandeghat, an area that was home to the best skiers at the races until the Hkom/Kanas team started showed up in 2009. 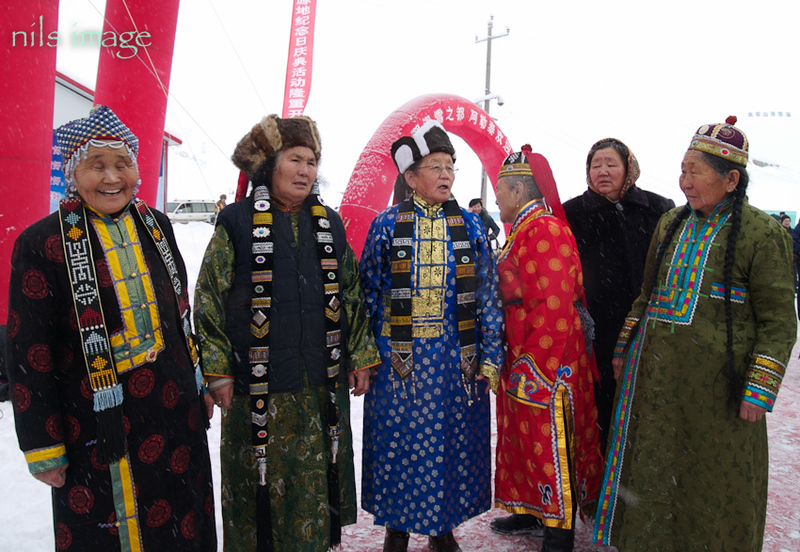 They are predominantly true Mongols, I think belonging to the Orinkai (?) clan. 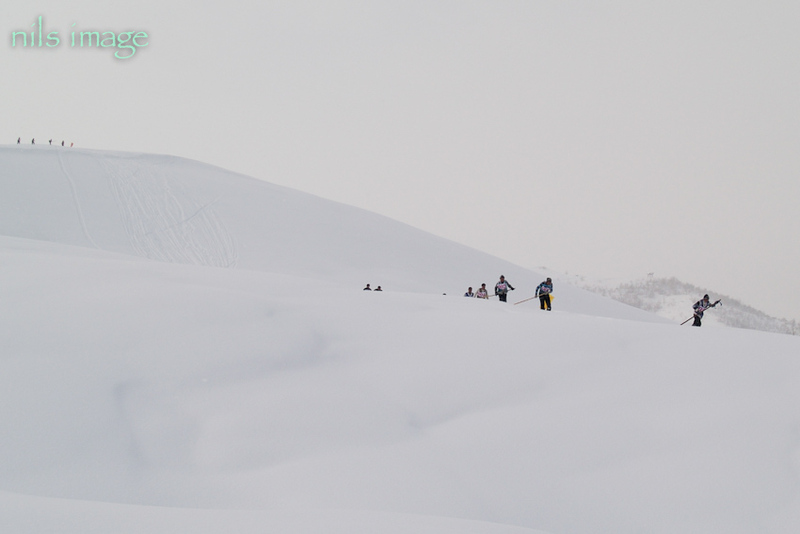 The skiers were instructed to climb up quite a ways and traverse over to a large open slope and ski down for the cameras. New snow here of close to a meter made skiing up and down slow and tedious. Look at the guy out front to get an idea of ski penetration. The day after the big snow ended the skies cleared and the weather turned very cold. 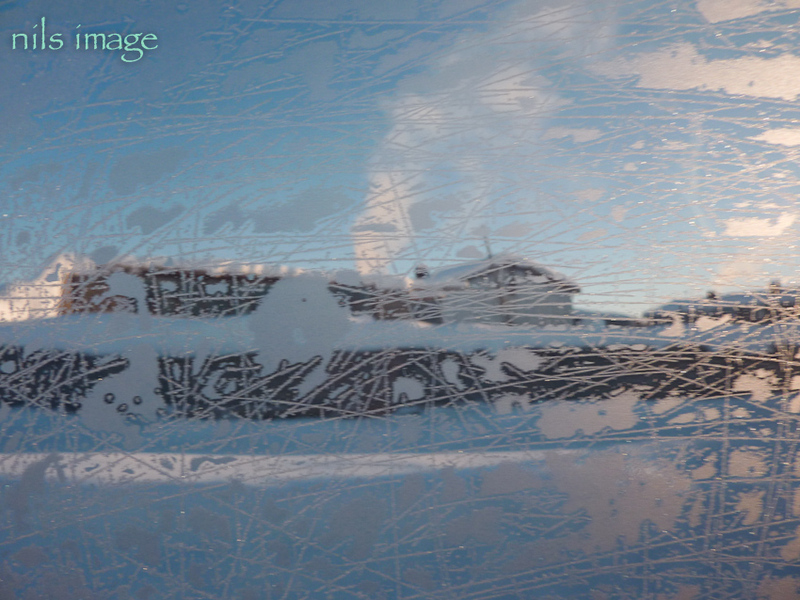 -35C this morning and by the end of the day (in this picture) it was again in the -30s. 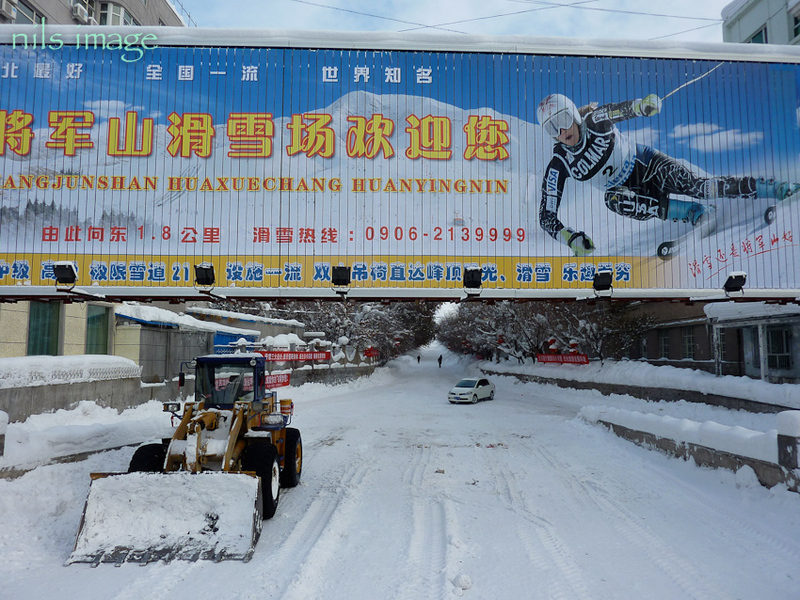 In Altay City there is snow removal equipment but they don’t seem to be in the “remove as it falls” camp. 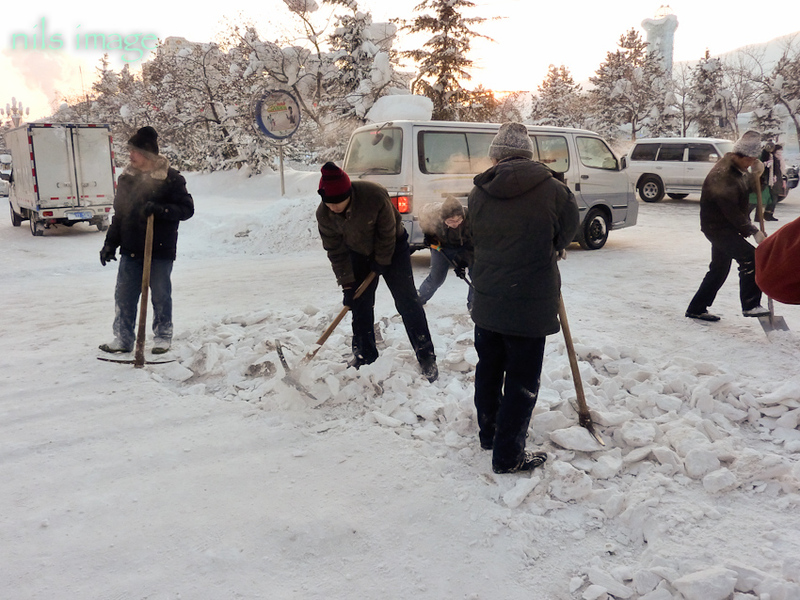 Consequently the snow gets packed hard and deep on the roads and sidewalks and hand crews are brought in with sledgehammers and shovels to break up and clear the roads by hand. 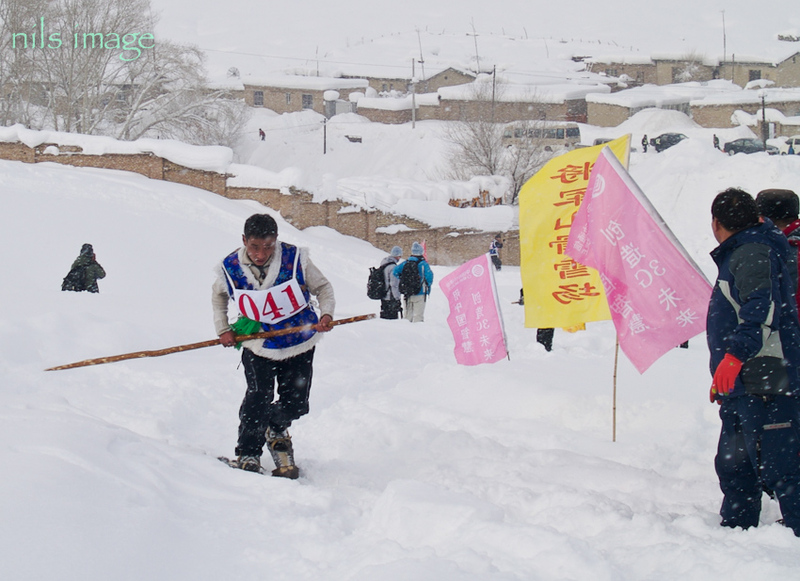 It is quite a feat of human power and employs a lot of locals. Looking towards Altay City (left) from near the top of the new ski area. Ayken trying out full downhill mode in Altay City. 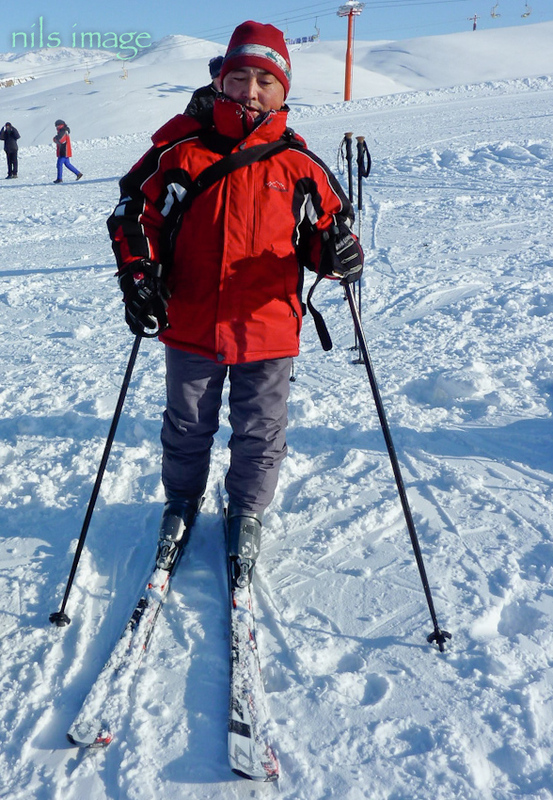 skiers were given the opportunity to ski on modern equipment, with free use of rentals. 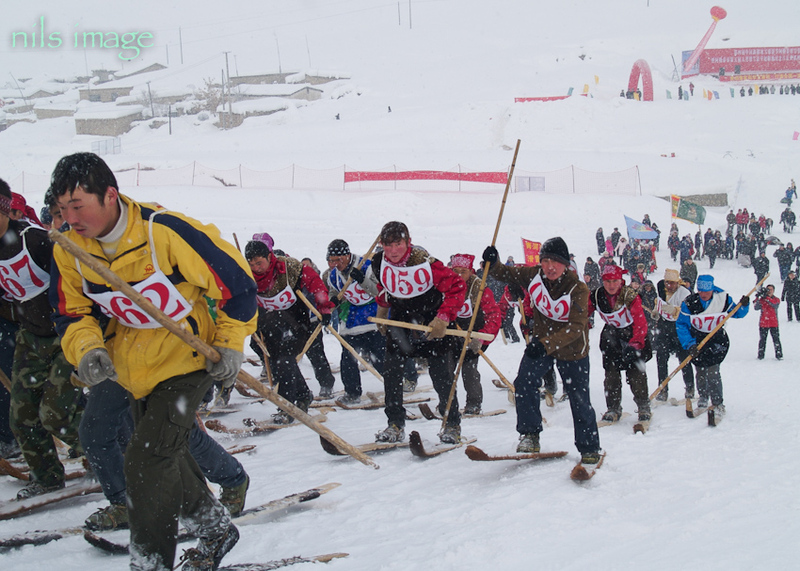 There was also a slalom race for modern skiers with the usual standing around and waiting, brutal in those temperatures. I climbed up using skins and/or the nowax base, something the chinese couldn’t understand with the new lifts in place and running, albeit painfully slowly. the Tbar used to access the race course was about 20% faster then me just skiing up along side and I had the advantage of staying a bit warmer. 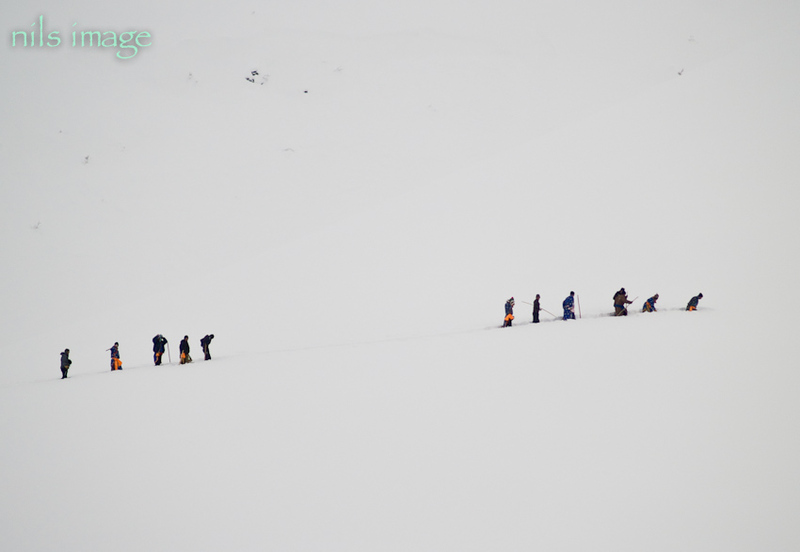 The locals were all speed, careening to a stop at the bottom and getting back up to repeat figure 11s back down. A few of them worked on turning and did pretty well but mostly they just pointed them downhill and figured out a kind of “Altai hockey stop” at the bottom. 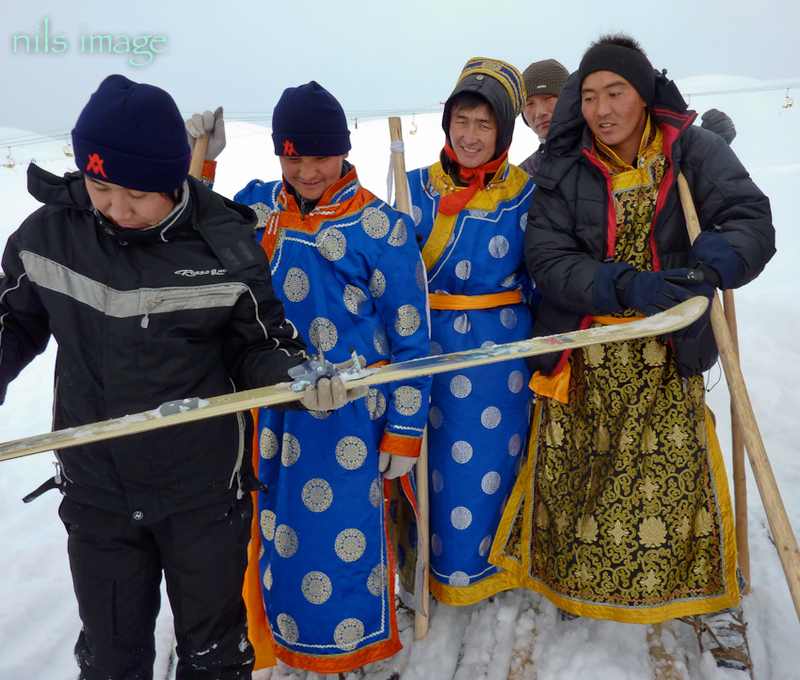 They were laughing and generally terrorizing the much slower and more timid chinese skiers on the hill. 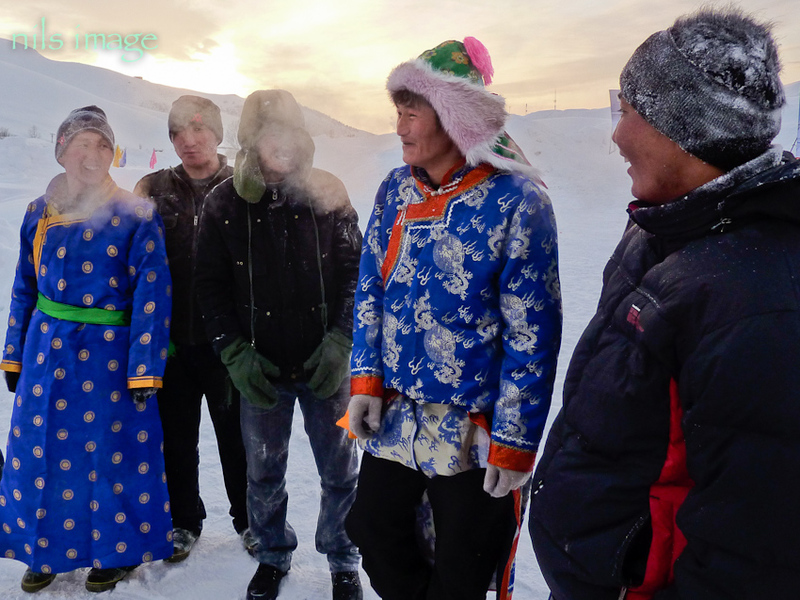 The following morning Ayken and I loaded up with Shan Zhaojian and a CCTV film crew and drove to Khandeghat, home to the strong Mongolian skiers in the area. 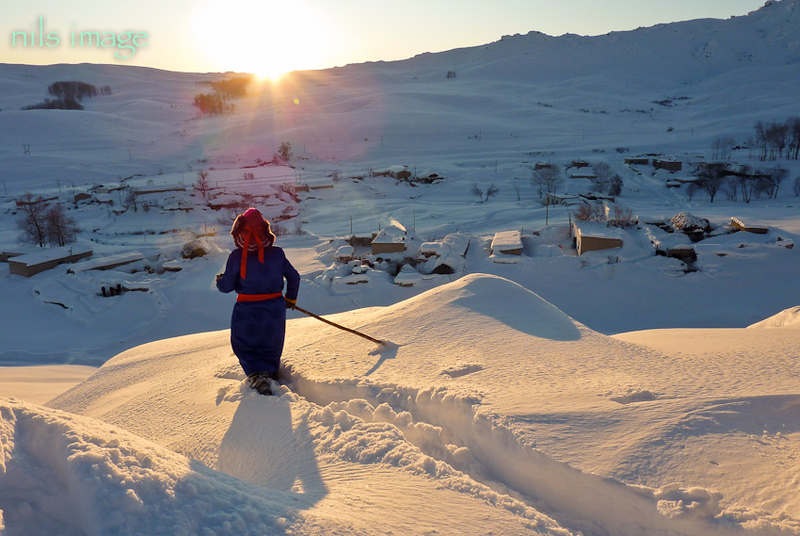 As it turned out the main contingent of skiers were from a small settlement nearby called Temur Ta (place of iron?). 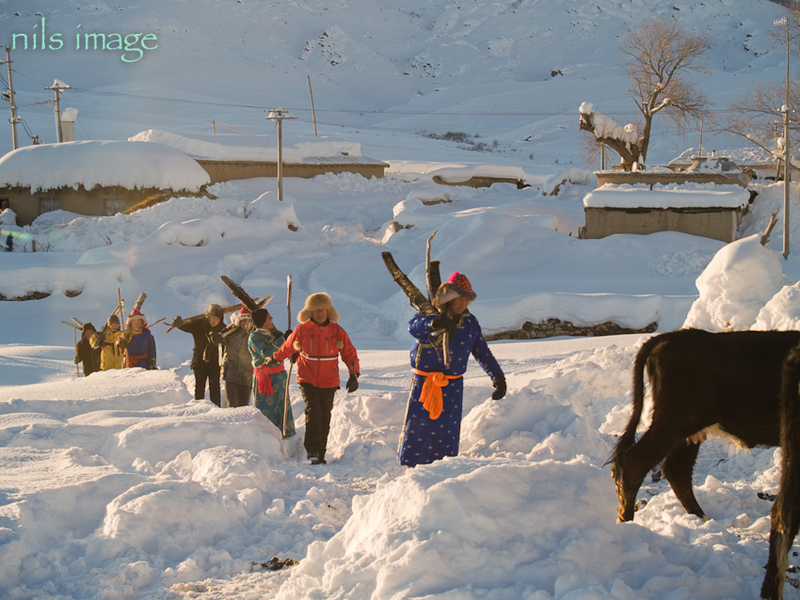 We walked and road horses the 3-4 miles and arrived in time to catch the last good light for a short ski near town. Lots of tea, local music and some great stories about skiing and the local ski history. 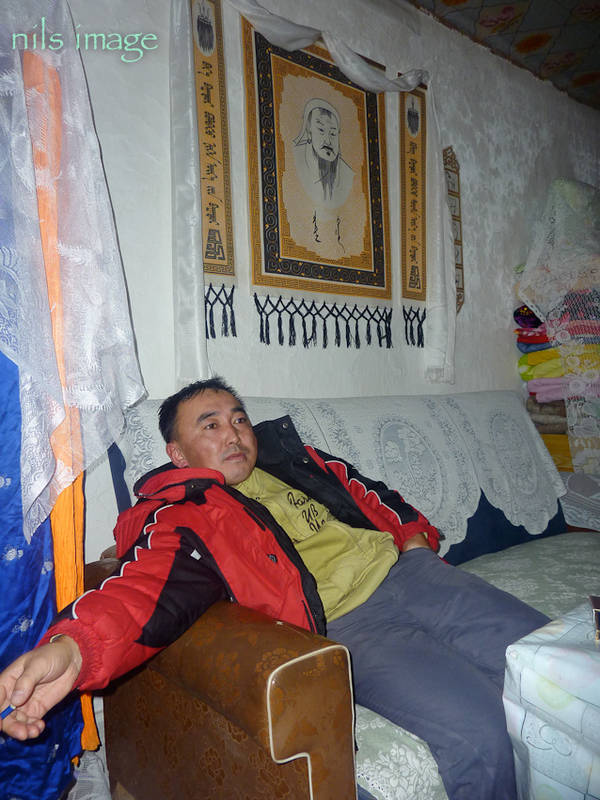 We walked back in the dark and then drove the hour plus back to Altay City where we gorged out on some excellent Chinese/nomadic food, quickly followed by the sleep of the dead…. The frosty view driving to Khandeghat. 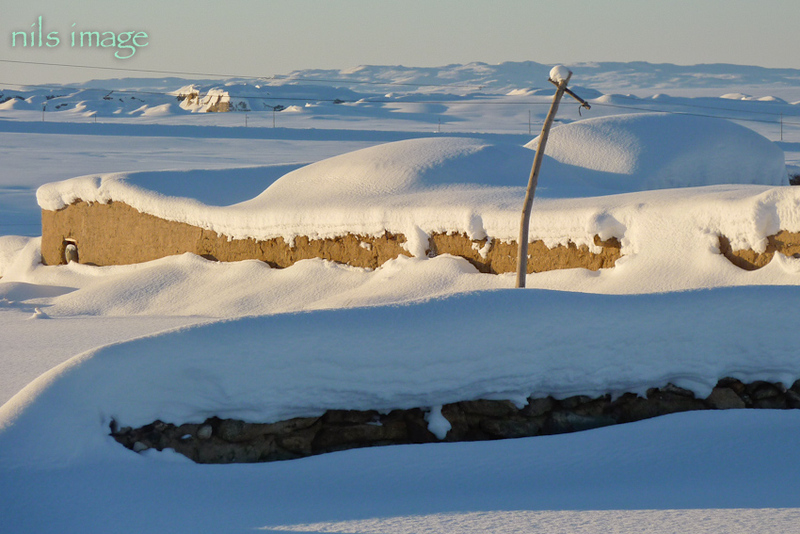 The view from a pee stop – mud brick is the typical building material in the area. Shan Zhaojian mounted for the trip to Temur Ta. 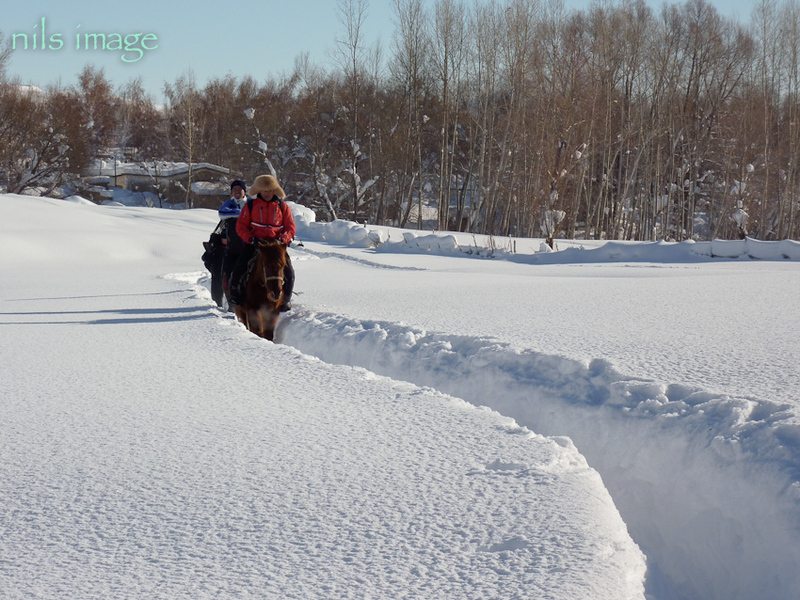 The snow was deep but well packed on the trail. Ayken relaxing after the walk to Temur Ta. 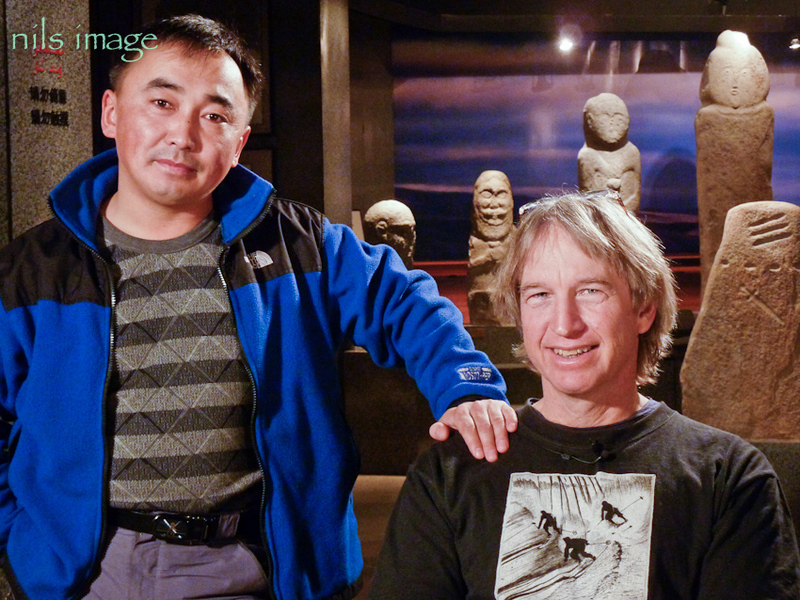 Typical picture of Genghis Khan behind Ayken with the white sash as a sign of respect and honor. Milk tea and bread with sour butter – served by every indigenous house in the region. After tea and a warm up we walked to the edge of town for a short ski. We hit the last good light, a beautiful but all to short a window. The skiers were great and it would of been good to spend more time with them. Overlooking Temur Ta. Lots of ski tracks around town. After skiing we went back to a local house for more tea and stories. 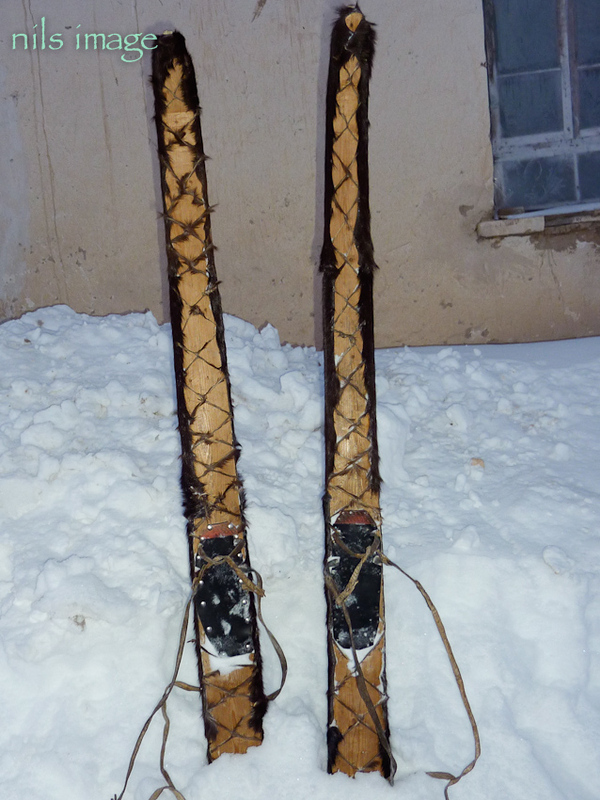 This set of skis is built with the traditional rawhide lacing used to attach the skin to the skis. My final day in Altay City included an interview with CCTV at the local museum, Ayken translating. Lots of questions on what I thought the history was and me gingerly tiptoeing around the “originated in china” theory. 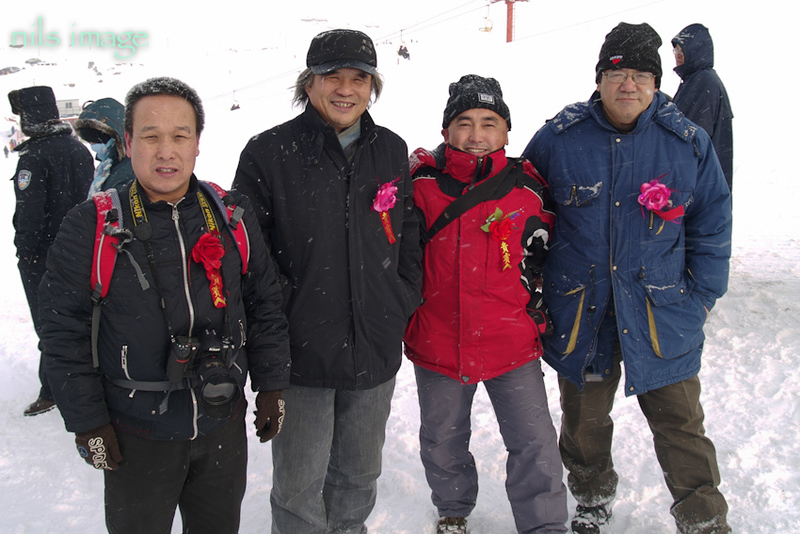 We talked for several hours and the interview became part of a special that was shown on CCTV the next year. 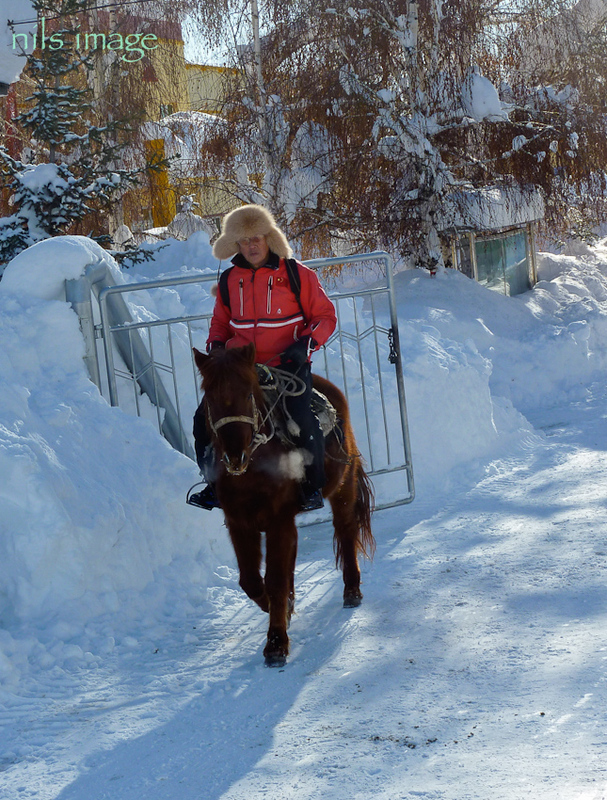 After 5 days in Altay City I was definitely ready to head into the mountains. There was some strong resistance to me leaving Altay City but in the end I was able to drive to Burqin, the gateway city and administrative center for the Northern Chinese Altai, my main place of research. This entry was posted on June 20, 2011 by altainils. 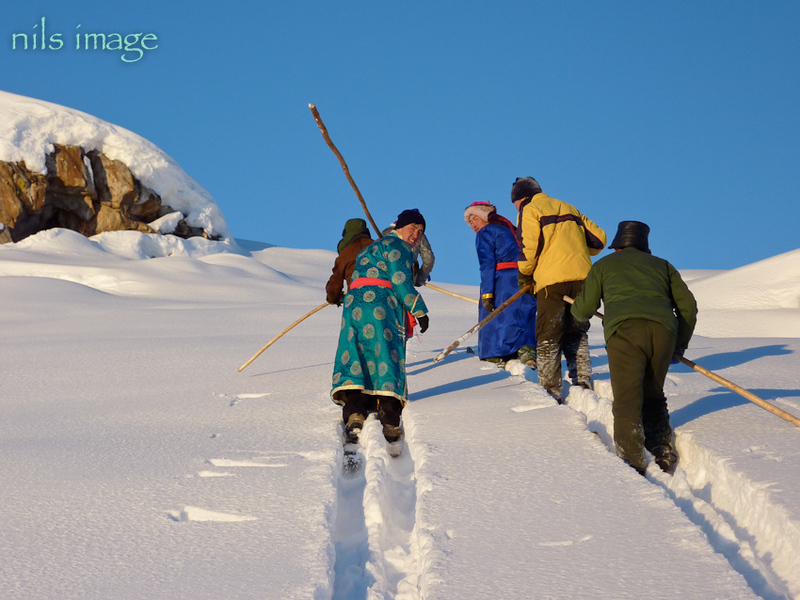 It was filed under Uncategorized and was tagged with altai, ancient, indigenous, mountains, skiing, traditional. Unbelieveably awesome adventure documented exquisitely with photos. Can’t wait to hear some stories in person!